Brunswick City Hall is located at 601 Gloucester Street, Brunswick, GA 31520; phone: 912-267-5500. Photo: Mahoney-McGarvey House, ca. 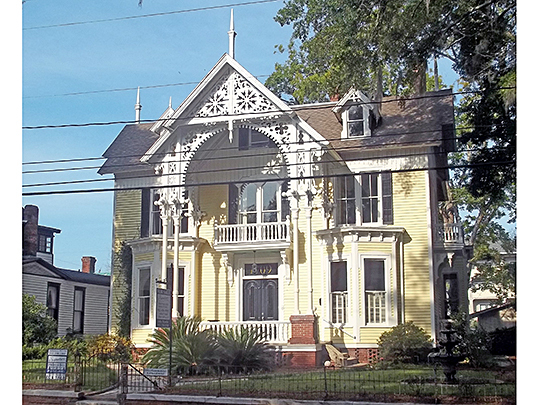 1891, 1709 Reynolds Street, Old Town Historic District, Brunswick, GA. The Historic District was listed on the National Register of Historic Places in 1974. Photographed by User:Ebyabe (own work), 2011, [cc-by-3.0 (creativecommons.org/licenses/by/3.0)], via Wikimedia Commons, accessed February, 2014. Brunswick is located on a harbor of the Atlantic Ocean, approximately 30 miles north of Florida and 70 miles south of South Carolina. Spanish explorers established missions in the area as early as 1569. The area's first European settler was Mark Carr who arrived in 1738. He established a large tobacco plantation named Plug Point, along the East and Brunswick Rivers. Brunswick was laid out in 1771 when the Provincial Georgia government purchased Carr's fields. The City of Brunswick is a historic, coastal city with origins dating back to the pre-Revolutionary War Period. In recent decades, the City of Brunswick saw a stagnant economy and population loss even as the surrounding communities were seeing growth and development. The most recent trend, however, is that the City of Brunswick is starting to see revitalization, particularly in its historic downtown core. The City of Brunswick is a majority African-American city and has a large concentration of low- and middle-income households. The surrounding coastal area, on the other hand, is predominantly Caucasian and largely high-income households. Proposed Character Areas are parts of Brunswick with a unique identity or uniquely defining characteristics. These include: Old Town, Industrial Waterfront, Hercules, US Highway 17 Corridor, and North Brunswick. Neighborhoods in the City of Brunswick are distinct in character but most share some key common characteristics. Most neighborhoods display a connected, rectangular street grid which serves to maximize connectivity between different land uses for both vehicles and pedestrians. Most neighborhoods also feature one or more square parks in a central location within the neighborhood boundaries. Most neighborhoods are also defined by predominantly single family housing, though housing styles and the pattern of lots vary greatly depending on the era when the neighborhood was first developed. The neighborhoods include: New Town/Town Commons, South End Brunswick, Liberty Harbor, Dixville/Habersham Park, Windsor Park (Historic District), Mayhew/Urbana, Parkwood and Riverside. The City has established a historic district covering Old Town Brunswick and oversees development and renovations in this area through its Historic Preservation Board. The City has also developed a Traditional Neighborhood Development zoning district in order to promote new development that is compatible with historic development patterns. Brunswick, Georgia: History, en.wikipedia.org, accessed February, 2014. City of Brunswick Georgia, prepared by EDAW Inc., Malvada Consulting, City of Brunswick Comprehensive Plan: Community Participation Program, 2007, www.brunswickga.org, accessed February, 2014.